Foremost, I would like to apologize for the lack of entries for the past month. Beloved and I have been preoccupied and have been lacking funds as of late, mostly due to the release of the 6th Pokémon generation. We did manage to go to some places, but a couple of them is pending a revisit. This one, we probably won’t visit again sometime soon so I decided to write about it. Shi Lin is a Chinese restaurant located at the alfresco area of Lucky Chinatown Mall in Binondo. That particular day, we were visiting Binondo to shop for bargains. We were supposed to try out the “must-try” places. Sadly, they were full and we didn’t want to wait. The other places were places we’ve been to before, are accessible from where we are, or just didn’t match up with our tastes and budget that day, especially since we were in a frugal mood. Shi Lin was the only place that wasn’t full and had stuff that we fancied at a somewhat reasonable price (although still not as cheap as we wanted), so we tried it out. I found they had interesting dimsum. Although it’s not as extensive as other Chinese restaurants, they were among the most unique. We ordered their Xiao Long Bao (155 Php), Shrimp and Pork Shao Mai (188 Php), and Mushroom and Vegetable Bun (125 Php) from their dimsum offerings. Since we were quite hungry and wanted something with soup and noodles, we ordered their Braised Beef Noodles (275 Php) which we decided to share. Finally, I asked for their a refillable pot of their Taiwan Phoenix Oolong Tea (40 Php) and Beloved asked for their Iced Taiwan Milk Tea (118 Php). 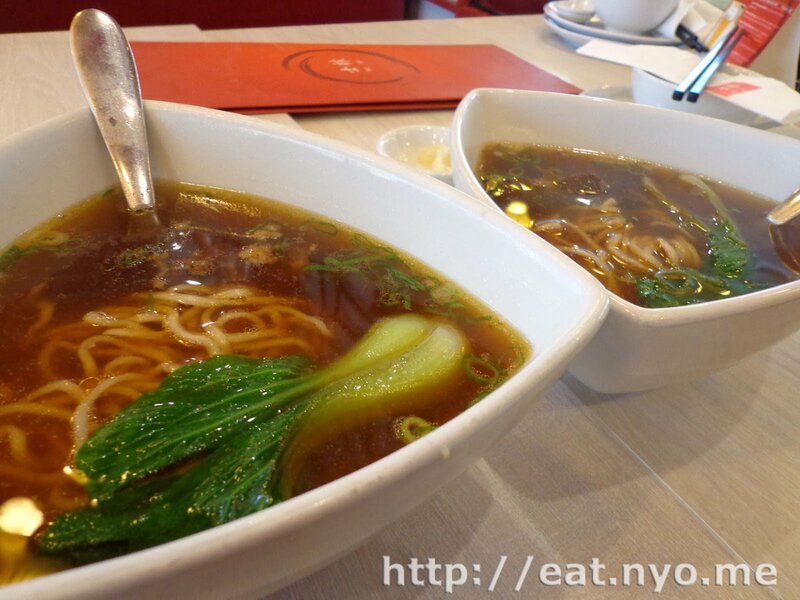 Our soup, the Braised Beef Noodles, arrived first, quickly I might add. I found the service nice, as they split our order into two bowls. It’s not the best soup we’ve had though. It was a bit on the sweet side and the noodles, while nice and firm, were lacking in bite. The meat was soft, but not as tasty as we would’ve liked. Frankly, it wasn’t the best, especially considering the price, but it did fill us up. Our other orders were much more interesting. 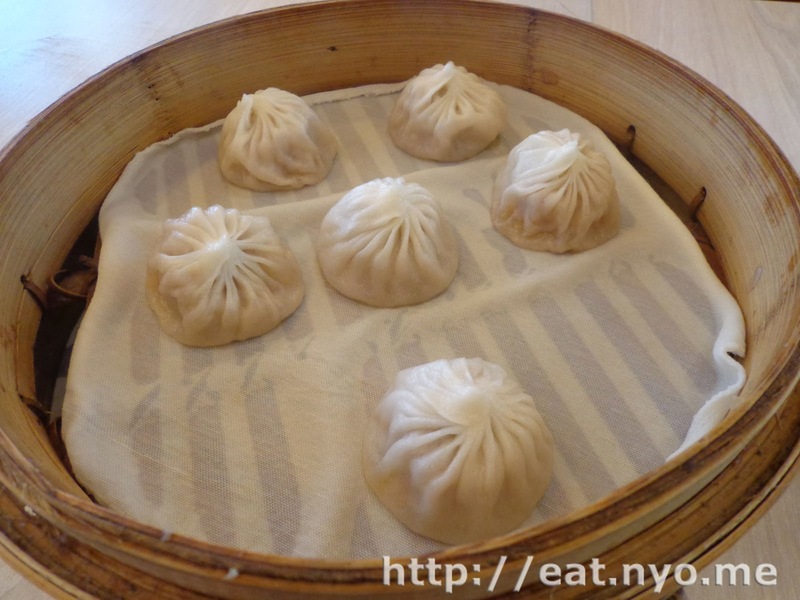 Their Xiao Long Bao were quite sizable and had a very soupy inside with minced meat mixture. I believe the meat they used was a paste of shrimp and pork. I also found it helpful that they put it on a steaming cloth rather than paper, as such it didn’t stick and was quite easy to handle. See my Smart Nomnom Tip below on how to effectively consume this. The most interesting looking order was their Shrimp and Pork Shao Mai. Actually, the only reason we ordered this was because it looked like this in the menu. 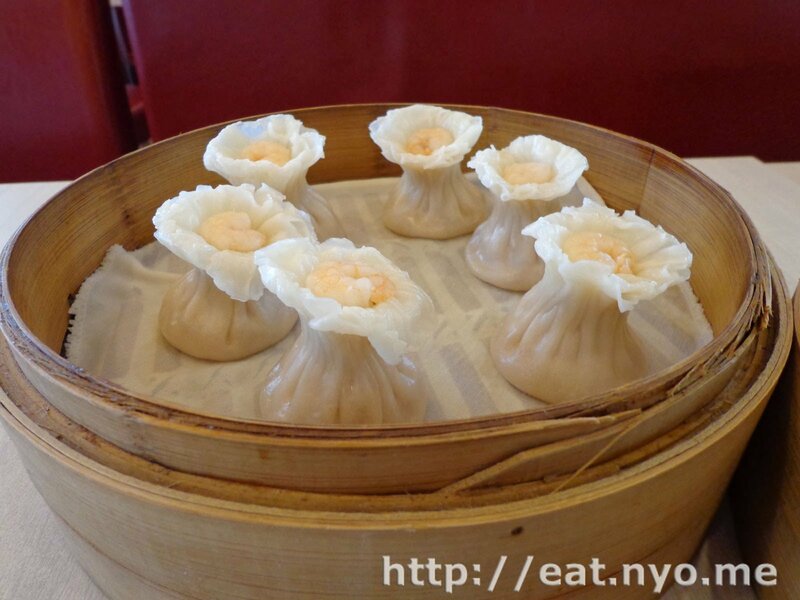 These funny looking dumplings are shaped like a vase with a shrimp on its mouth and a similar pork and shrimp paste inside. It’s pretty difficult to consume it all at once, though, so I ate it in at least two bites, first with the shrimp, then with the filling. While it was pretty good, it’s not really that spectacular flavor-wise. 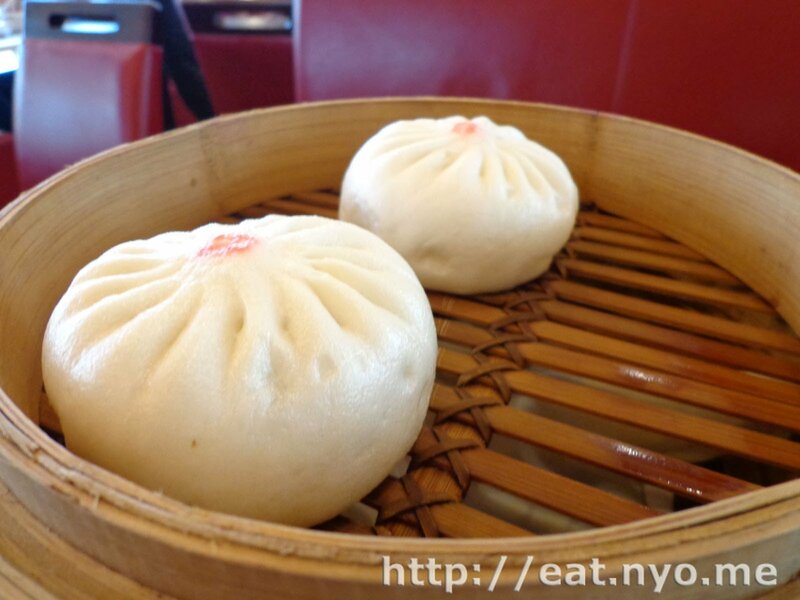 Our last food order was for a couple of Mushroom and Vegetable Bun. These siopao had the promised mushroom and vegetable filling. Sadly, Beloved didn’t like the fact that they were minced, pretty much like the filling of our meat dimsum orders. I found it okay, with the stuffings giving a crunchy veggie sensation, if that makes sense. It’s also pretty filling, as with most of our orders. Our food was overall not bad. I must say our Taiwan Phoenix Oolong Tea was perfect with our dimsum, giving our meal a fragrant, hot complementary brew. I only wish it was on the house. 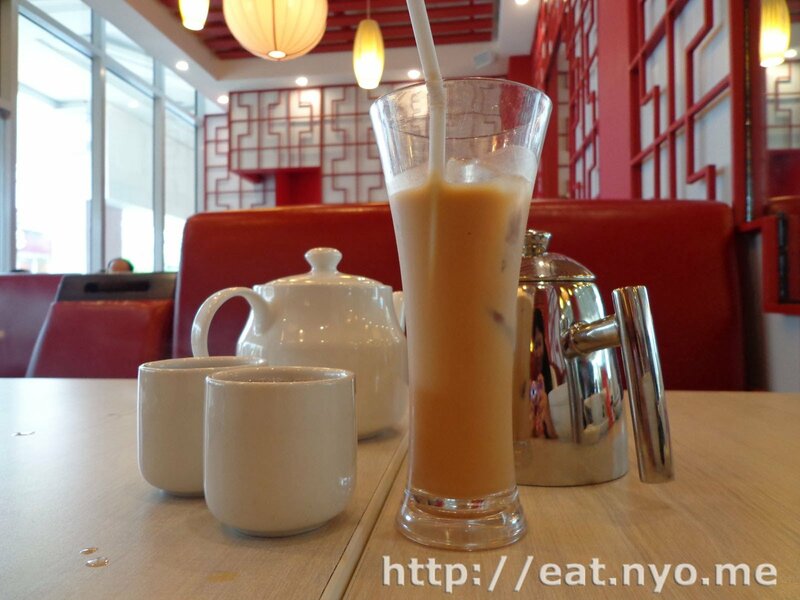 Beloved liked the Iced Taiwan Milk Tea, mentioning it tastes like Hongkong Milk Tea. Honestly, since we only had one order of their soup shared, I wasn’t as full as I wanted but Beloved was. Anyway, we were both disappointed that we weren’t able to go to famous Wai Ying, but for nourishment before venturing into the dangers of the Binondo shopping centers, our visit to Shi Lin sufficed. Not recommended for: Frugal Chinese food haters. Smart nomnomnom tip: Place Shao Long Bao in soup spoon, bite off tip, and sip hot soup.